The funny folks behind the goofball web series Red vs. Blue are trying their hands at a feature film—and it's a scifi comedy. Plus, an English version of Osamu Tezuka's space Western, a line of high-quality Greek mythology toys, and a diverse superhero anthology are all looking for a bit of crowdfunding help. Aaron Allston, Michael A. Stackpole, Timothy Zahn, Maxwell Alexander Drake, Jaym Gates, Addie J. King, Jean Rabe, Aaron Rosenberg, Janine Spendlove, Bryan Young, and other authors take on stories of superheroes who break out of the usual mold. These stories will feature heroes, villains, and sidekicks of varying genders, ethnicities, ages, body types, and life experiences, including heroes who are too green, heroes who are past their prime, heroes who are out of shape, and heroes with all manner of quirks. Backers can get the ebook for a $5 pledge or the paperback edition for a $25 pledge. Act out your own version of Clash of the Titans with these highly articulated action figures, designed with play and customization in mind. 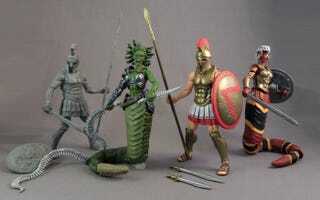 The first set of toys features Greek warriors and Gorgons—the latter with posable snake tails. Backers can select a figure starting at the $30 pledge level. This project is already beyond comfortably funded, but if you want to get your hands on a digital download of the finished film, you can nab one for a $25 pledge. The publishers who brought manga legend Osamu Tezuka's Unico to English-speaking audiences wants to do the same with Captain Ken, Tezuka's space Western, which helped launch the manga crazy in Japan and make Tezuka a household name. Captain Ken travels to Mars, which has been colonized by humans, with his sidekick and gadget-horse Arrow, but finds himself caught in the crossfire between Martians and Earthlings. For a $15 pledge, backers can grab the first two volumes plus the companion notes in digital form; they can get physical copies of the two volumes for a $35 pledge.